As much as we hate to see the warm summer sun become tinged with crisp fall air there is no way to stop it. Before we know it our swimsuits will be tucked away, bottles of insect repellent will take up residence below the sink, and the green leaves will begin to put on a spectacular show of color. Our minds will begin to drift towards our winter vacation plans. Disney World in central Florida is perhaps one of the best places to visit during the holiday season. 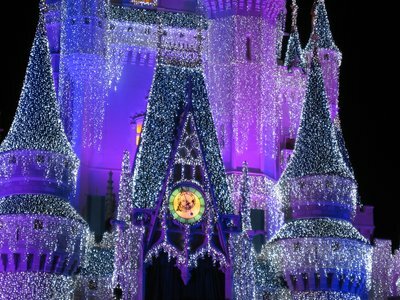 The holidays at Disney World begin just after Halloween and extend through early January. A holiday at Disney World offers something for every member of your family. You will be blown away by the sheer number of Christmas lights that adorn the property. You can spend the evening watching the amazing Osborne Family Spectacle of Dancing Lights at Disney’s Hollywood Studios, be treated to a Florida snow storm at The Magic Kingdom during Mickey’s Very Merry Christmas Party or experience Holidays around the World at Epcot. The best part about a holiday trip to Disney World is that your family can enjoy time together, relearning what makes being a part of a family so incredibly special. Often we get so caught up in the hustle and bustle of school, homework, jobs, chores, shopping, and daily routines that we forget this amazing facet of our lives. Disney World offers a chance to tackle the world as a team. Enjoy meals together that are not flanked by unfinished projects and tasks. You can experience hundreds for dining options from fine dining, to ethnic food, to character meals to dinner shows. As a family you will eat, laugh and be merry; which is something that often goes by the wayside in our day to day lives. The theme parks (Which include The Magic Kingdom, Epcot, Hollywood Studios, and Animal Kingdom) will bring you up close and personal to many childhood heroes as you explore the worlds’ largest playground. Rides and attractions to suit everyone in your group will make doing things together a real possibility. When Walt Disney began planning Disneyland, he recalled many times bringing his children to local amusement parks and sitting on a bench watching them have fun. He determined his park would be a place where families could have fun together and he truly delivered on this! Attractions like The Jungle Cruise, Pirates of the Caribbean, The Haunted Mansion, Soarin’, Toy Story Midway Mania, and Kilimanjaro Safaris will be hits with everyone in your family! Disney World is not all about characters and roller coasters, however. Go for a family fishing trip, horseback ride through the woods, take a bike ride down the boardwalk, drive a race car, play a round of golf, or lounge by the pool. There is so much to do and see the possibilities are seemingly endless. Mom and Dad can even enjoy a night out at a romantic restaurant while the kids enjoy one of many on site dedicated kids clubs. There is a resort and package to meet every budget and with offers such as Free Dining (this means your entire group eats for free during your stay!) and room discounts, a Disney holiday trip is something that more and more families are learning the value of. If heading to Disney World has been on your radar I encourage you to take the steps towards planning a magical getaway. There is no greater holiday gift than the gift of time with your loved ones! This entry was posted in Deals and Discounts, Family Fun and tagged Dining and Restaurants, discounts, family, Holidays. Bookmark the permalink. ← Best uses for fastpass!